The Nanny Joynt is working with a fun and busy family who will be relocating to North Scottsdale in December! Their son is 4 years old, he loves being outside, playing with Legos and enjoys baking and cooking in the kitchen. Their daughter is 15 months old, she is a sweet and sassy little girl who loves to climb and stay busy. She does have a peanut allergy so a nanny who is comfortable using an Epipen if necessary is essential. The schedule for this family will be Monday – Friday 6:30am – 4:00pm or 7:00am – 4:30pm – every other Friday you will be off around 12:30pm. This family will need a nanny who can provide flexibility in terms of the schedule as they will need their nanny 7:00am – 7:00pm when Mom travels about 1 week per month. When she does travel she likes to give her nanny some time off before/after her trip. Mom will know her of any trips 1-2 months in advance. They would also like a date day/night each month as well. Availability for occasional overnights/travel with the family would be ideal. The position is offering $17 – 18/hour with guaranteed hours, PTO, and 7 paid holidays each year, mileage reimbursement. The family will provide a family vehicle for nanny to use when transporting the children however, you must have a safe and reliable vehicle which may be needed on occasion. The ideal candidate for this position will be extremely efficient and organized, engaging, effective at multitasking while managing the children, a true team player happy to pitch in whenever and wherever needed. This position is ideal for someone who is flexible, takes initiative, has a lot of energy and LOVES being a nanny! Their new nanny should be able to follow direction, but also be willing to come up with ideas on her own on what to do for the day or should a problem arise. Mom will be working in her home office 100% of the time and will transition to working at home about 50% of the time in April. A nanny who is active, loves teaching the children new things and doing arts and crafts with them would be appreciated. Mom likes for the children to get outside and see nature as much as they can. Child related duties will include, but are not limited to: Overall childcare, bathing, driving, educational activities, potty training, feeding, naps, walks, outings, working on developmentally appropriate activities and being sure the children are engaged and their needs are met each day. Household responsibilities will include: Children’s laundry, light house cleaning (the family has a cleaning service that will come in 2x’s a month for deep cleaning), loading/unloading dishwasher, tidying, organizing, family meal prep/cleaning up after meals and making sure the home is clean and in order each day. They would also like a nanny who is able to prepare simple meals for the family when Mom is traveling. This family enjoys open communication with the nanny and loves receiving texts and photos during the days. In general each day you will arrive and prep son’s lunch, make breakfast and get the children ready for their day. Take their son to school and return home clean up from the morning, playtime with their daughter, enjoy some time outside or at a park/museum/aquarium etc, nap time, kids laundry and enjoy playing with and engaging the kids until mom is done working. You will need to pick their son up from school on occasion. They are seeking a nanny who will make at least a 1 year commitment to their family and would ideally like someone long term. Nannies this is an awesome job for the right candidate who is organized, FUN, upbeat and has a true love and passion for being a nanny and caring for kiddos. Their kiddos are adorable and SO much fun! They have had nannies in the past and truly understand and value how important the role of their nanny is for their family. They are excited to meet a new nanny who can be a great help and make a lasting connection with the kids! 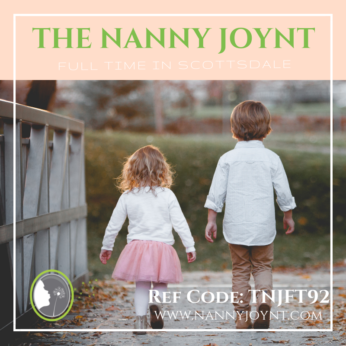 If you possess all the qualities above and are ready to work with a really wonderful family please send your resume to trisha@nannyjoynt.com REF CODE TNJFT92!